After markets and smartphone OEMs were stunned with the announcement of the Helio X10 powered Xiaomi Redmi Note 2, the Chinese handset manufacturer might be intending on delivering a whole new level of shock to customers and companies alike by introducing an even more powerful version of Redmi Note 2. According to the latest leak, Xiaomi Redmi Note 2 could be released during the later months of 2015 sporting MediaTek’s Helio X20 chipset. Helio X20 is expected to be present in smartphones very soon and it is already famous for sporting a deca-core processor. The SoC will not be running any Cortex-A57 cores and will be replaced with two Cortex-A72 cores. These cores will not only be powerful, but will be far more efficient as compared to Cortex-A57. Since we have yet to see any overheating issues sprouting from MediaTek chipsets, it is expected that Helio X20 will effortlessly be able to exceed the capabilities of both Snapdragon 810 and Exynos 7420. What is even more exciting about this revelation is that Xiaomi Redmi Note 2 already carries a killer price tag of $125 (running the octa-core Cortex-A53 at 2.0 GHz). Our assumption is that while the Helio X20 powered Xiaomi Redmi Note 2 will be more expensive than the variant that sports Helio X10, the Chinese company will most likely price it in such a manner that it kills the competition altogether. 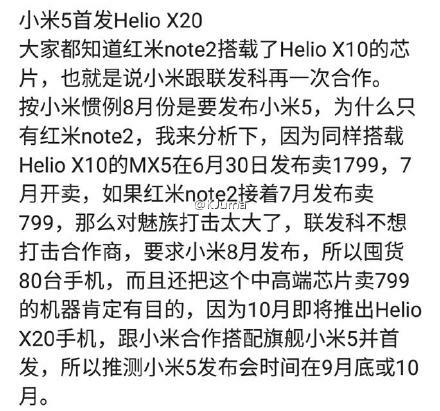 While the following has not been confirmed, it is possible that the Helio X20 powered handset is going to be incorporated with more RAM, although this will mean that consumers will be required to spend more in order to purchase it. However, if you are getting more performance from a smartphone that costs far less than the competition, then it is a future purchase that consumers will be looking forward to. Xiaomi Posts New Teasers For July 16th – The Mi5 Or Redmi Note 2 Headed Our Way?